It’s that time of the year. University essays are piling up, my bank account is worried about the amount of Christmas presents I still need to buy and I am missing home. My parents’ visit to England last week was absolutely amazing! But soon as they left a massive wave of homesickness crashed over me. Spending time with them was great and finally being able to show them the city I now call home felt so good. Having to drop them off at the station to get a train back to the airport was everything but amazing, though. I have been living on my own – in a foreign country – for over three years now and I get this Living Abroad Blues every now and then. Moments where I reconsider my life choices and wonder whether this whole move to England was a good idea in the first place. I’m missing so many moments with my family and friends in the Netherlands. Is it all worth it? 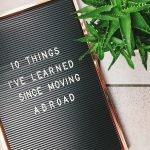 England has shaped me into the young woman I am today and I’m incredibly proud of myself for dealing with doing a university degree in my second language, work on the side to pay the bills, have a social life and keep up my blog. It’s hard sometimes, but I love my life here. It’s normal to miss home. I’ve grown up in a small countryside village where my family and friends lived no further than a 5 minute bike ride away from my house. Compare that to the massive city I live in now, filled with people who have grown up in a completely different culture than my own. I love the English, they’re incredibly friendly and most of them have nothing bad to say about me being an immigrant. But there will always be a difference between the English and the Dutch. I’ve acclimated to my new culture here in England quite well and when visiting home I can be quite shocked by how straight to the point the Dutch are – much like myself before I moved to England. It’s hard to feel like you don’t fully belong in either cultures anymore. Speaking English 24/7 for the last three years has changed the way I speak Dutch. Not only do I forget Dutch words, my accent has shifted too. I now speak both English and Dutch with a strange accent that nobody can place. But there are reasons I moved to England and left the Netherlands behind. Whenever I visit home I am usually eager to go back to my place in Manchester and continue the degree I love so much. It’s tricky having two homes in two different countries, but they both feel like home to me. I’ll be flying back for Christmas and I can’t wait to spend time with my sisters, my mom and dad, my family and my best friends for 10 days. What I do to get rid of this Living Abroad Blues? I blast some Dutch songs through my apartment, I read some Dutch books I have on my bookshelves, watch some Dutch television and dive back into the never ending to-do list that keeps me busy until my flight home for Christmas. Do any of you guys live abroad and struggle with the same issues? I can relate to what you say. I have been living for 7 years outside my own country. It has shaped me. But believe me this experience you have use it, enjoy it, nit everyone has that opportunity. You are now officially a citizen of the world. Just remember travel and experience make us grow!!! I can 100% relate. I am dutch myself, and moved to England last year for my studies. I forget my Dutch, but I still believe that I like the Dutch culture is better than the English. Don’t get me wrong, I love my life in England and would not trade this experience for the world! Hahaha, I feel that! Never forget your Dutch roots, it’s so important to stay connected to your own culture whilst living abroad! Love some good Dutch songs and stamppot haha!